The cottage is freshly decorated and comfortably furnished with a king size and two king single beds,electric blankets, quality linen, gas heat pump, a very well equipped kitchen and ski boot drying rack. A private garden with new bbq, outdoor furniture options and a sunny verandah with wonderful rural and mountain views make it a lovely year round holiday home away from home. Golf courses, restaurants, wineries and 5 skifields are all within easy driving distance. Only 5 minutes from historic Arrowtown with its quaint streets and great shopping and restaurants/cafes. Let us know if your stay is for a special occasion, we like to help make it memorable. We include tea, coffee, milo, milk and home baking on arrival. Laundry facilities available free of charge. We are a middle-aged couple who have travelled extensively and like to share our little piece of paradise with guests. We live on the property but the cottage is 40m away behind a hedge for total privacy. We are happy to share our local knowledge but will leave you to enjoy the peace and tranquility our rural environment offers if you prefer. Many bike, walking trails, skiing, golf and adventure tourism activities all very accessible. New shower, vanity and toilet with heated towel rails, fan, window to outside, hairdryer and toiletries provided. Orchard Cottage is a real home from home and the owners are incredibly thoughtful and hospitable. We thoroughly enjoyed our stay at Orchard Cottage and the incredibly well equiped accommodation provided an excellent base to enjoy both Queenstown and Arrowtown . We enjoyed sitting on the veranda with rugs over our knees watching the light changing on the mountain after eating our barbecue. We walked to Millbrook Estate and down to Lake Hayes using Jane's thoughtfully provided directions. Jane is an incredible host and we enjoyed her delicious muffins and plums from the orchard. We look forward to our next holiday at Orchard Cottage, thank you so much Jane and Roger! We had a fantastic and perfect stay. The cottage contains everything you could ever need, location is great for exploring, a car is recommended. Jane and Roger were the perfect hosts. We all fell in love with the property as soon as we arrived. The location was fantastic for what we were wanting to do on this holiday (cycling/walking on the trails). We definitely want to return again. ?? Wonderful stay in every way. Comfortable, relaxing, amazing hosts and nice location. Close to everything, but away from it all at the same time. Arrowtown is a lovely community. Liked it as much or more than Queenstown! 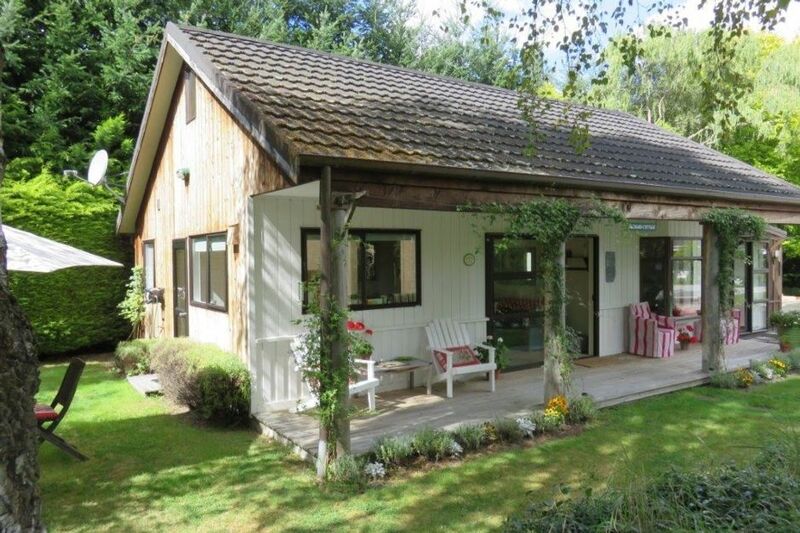 Very private, warm and cozy cottage in rural setting with excellent modern facilities. Couldn't fault the host - an excellent friendly host who had the cottage set up beautifully for our arrival (including fresh cut flowers, delicious fresh baking and other treats) and was very responsive to any questions or special needs that arose (umbrella when it rained etc). Very clean and tidy accommodation. Not that any of these bothered us particularly, but some things to note: the bedroom with the two single beds is accessed through the other bedroom; there is no lock on the bathroom door; shower has fixed energy-saving head (so not particularly good water pressure in the shower); king size bed is fairly firm, but then it may have been softer without the electric blanket; car park space is very close to cottage but not under cover. Overall excellent value for money though, very happy with our choice. Thanks for your feedback on how we can improve our cottage experience but I am delighted you enjoyed your little anniversary break together. A lock has now been installed on the door of our newly renovated bathroom. I am sorry if this oversight made you feel uncomfortable during your stay. We have a floor plan which we send to anyone who wants to book the cottage and requires both bedrooms so they are aware of the layout. I will buy a mattress topper for our king size orthopaedic bed so your next stay will be more comfortable. We are happy to offer garaging to anyone who requires it and this happens from time to time, you just needed to ask.